Composite image of the 12CO (blue), 13CO (green), C 18O (red) (1 − 0) peak-intensity main-beam temperature. The circles show the typical extensions of the H ii regions and the crosses show the position of the associated exciting stars (see Table 1). The σ-Ori star that excites the IC 434 H ii region is located 0.5◦ East from the Horsehead nebula. 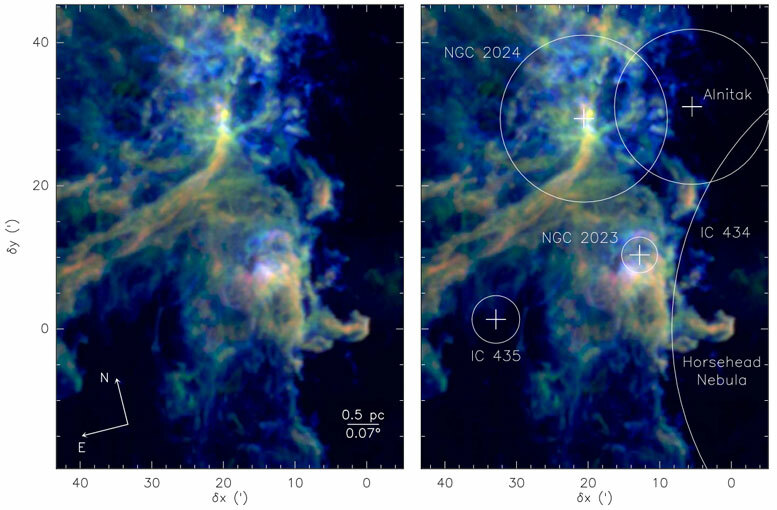 New research on the molecular cloud complex in Orion-B reveals the detailed relationships between the gas and dust, and quantifies how the spatially varying intensities of the molecular lines reveal the physical conditions. The Orion molecular cloud is a large complex of hot young stars, nebulae, and dark clouds of gas and dust located in the constellation of Orion. Two particularly famous sights in the night sky, the Orion Nebula and the Horsehead Nebula, are members of this complex, which is relatively nearby, only about 1500 light-years away. Despite its fame, brightness, and relative proximity, however, this complex is not very well understood. Take its star formation, for instance. The relative roles of the local versus galactic-wide conditions are poorly modeled, in particular the contributions of small-scale processes like magnetic fields and turbulence as compared to larger scale activity like gas pressure or the streaming motions of gas within the galaxy’s spiral arms. One reason for this lack of understanding is that the nebula is densely packed with stars and activity while its dust obscures many of the regions from optical view. CfA astronomers Viviana Guzman and Karin Oberg were part of a team of fourteen astronomers who used the IRAM millimeter telescope to map the Orion-B giant molecular cloud (GMC), located in this complex, over nearly a full degree in the emission from over a dozen molecular lines (for comparison, the angular size of the moon is about one-half a degree). Orion-B is a typical GMC and is useful as a template for other GMCs elsewhere in the Milky Way and in other galaxies. There are a wide range of conditions found in this large region (about 25 light-years in size) and so the scientists are able to obtain a statistically significant breakdown of the region’s activities. One of the key questions the astronomers want to resolve by measuring both small and large-scale gas properties in this example is the linear scale needed to correctly derive star formation characteristics. In extragalactic studies of star formation, small scale measurements are usually not possible: to what extent are the interpretations of emission line ratios, for example, therefore suspect? The astronomers’ study of the molecular anatomy of this complex reveals the detailed relationships between the gas and dust, and quantifies how the spatially varying intensities of the molecular lines reveal the physical conditions. The visual extinction varies with location with values ranging from almost none to nearly opaque even at long infrared wavelengths. The team reports that the amount of molecular gas in any location correlates closely with the extinction, consistent with the picture that more extinction means more dust and thus also more gas. They also find a correlation with the illumination by ultraviolet light from massive young stars at the edges of the map, but no simple correlation between the gas densities and the fraction of radiated light. The paper concludes that the relationships between the line emission and the GMC environment are more complicated than usually assumed, emphasizing (for example) the importance of local chemistry in determining the intensities of the emission here, and in other galaxies. Be the first to comment on "Astronomers Reveal Detailed Relationships Between Gas and Dust in Molecular Clouds"